When your standard 2-channel audio interface doesn't quite meet the demands of a full band session, the M-Audio M-Track Eight opens up a who.. When your standard 2-channel audio interface doesn't quite meet the demands of a full band session, the M-Audio M-Track Eight opens up a whole new world of audio recording capabilities. 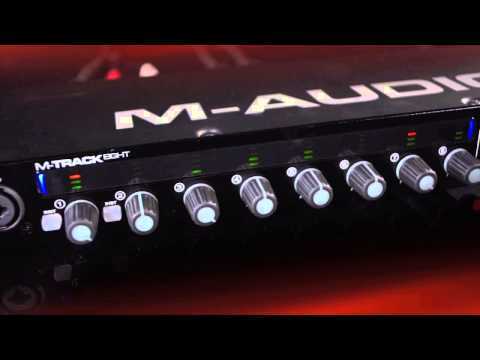 The M-Audio M-Track features 8 XLR / 1/4" combi jacks with mic/line auto sensing capabilities. The exclusive Octane Preamp Technology offers up to 24-bit/96 kHz resolution for studio quality recordings with super high headroom. The result is a robust signal path for clean, professional sound. In addition, each input comes with dedicated line-input circuitry so you can record and track with your favourite external preamps or vintage studio hardware. Front facing channels give musicians easy access to the interface when installing into a 19" rack. Monitoring and recording sessions with M-Track is made more convenient with individual channel LED feedback, and dual headphone outputs. Zero-latency monitoring is possible with the Direct Balance control. M-Track Eight is a project studio engineer's dream come true! Spark that initial idea or add the finishing touch to your latest masterpiece – whatever your production needs, Touch Loops’ 2GB sample library doesn’t disappoint! Based in Los Angeles and London, Touch Loops equips customers with the most cutting-edge sound elements, instruments, hardware, and software recordings, expertly curated by a team of professional music producers and sound designers. Now included with M-Track Eight, this 500+ sound library provides everything from must-have one shot drum hits to sultry melodic loops and deep, driving bass - whatever your project demands, this expertly curated sample content arms you with cutting-edge content to realise it!